WWII, Aircraft-Down, Emergency Communications, & the Maine Seagull Net! Bob Curtis, W1GRG at Ellsworth Ham Radio Breakfast. Joan N1NUA also pictured. War in the South Pacific, Maine’s paper mills, Ham Radio, and a large and growing family have all shaped Bob Curtis’s life. Many of us hams know Bob as W1GRG and hear him regularly checking into the Maine Seagull Net on 75 meters. In fact, he has been a ham since 1955 and was a Seagull net controller into the sixties. What you probably don’t know about Bob is that he fibbed about his age and joined the Marines when he was 16. He had three brothers that were already in the service and he was just anxious to join the military as well. Bob celebrated his 17th birthday from the South Pacific war zone in World War II. As a Marine machine-gunner he saw action in the Solomon Islands, Tarawa, and other places. He just missed landing on Iwo Jima because he and his unit were sent back to Kauai for some medical tests, since they had been deployed for 22 months. They found a spot on his lungs so the Marine Corps decided to send him back stateside. “I got out of Iwo Jima. 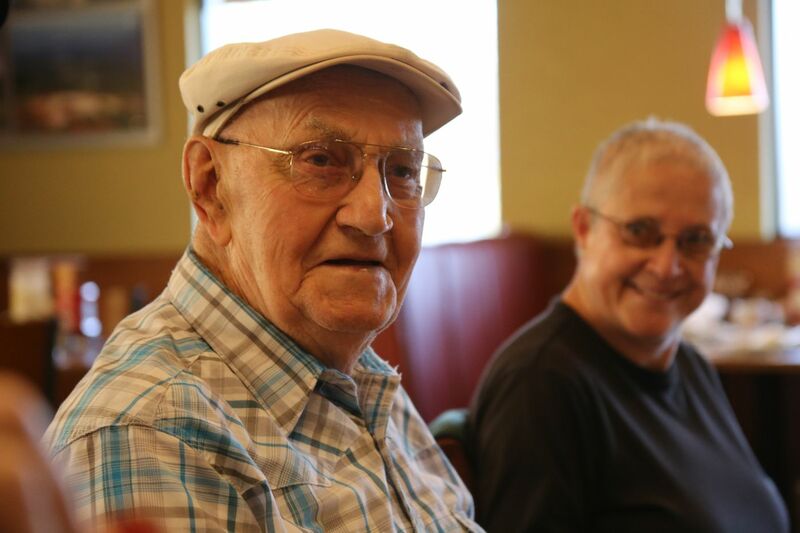 I lost a lot of guys over there,” said Bob during a recent interview at his home in Ellsworth. He got to see the WWII memorial and the other war monuments in Washington, DC when he flew down there on one of the “Honor” flights. Paper Mill Industry. After the war, Bob returned to work within Maine's paper mill industry. At one point in his career he traveled quite extensively when he worked for the Saint Regis Paper Company, including to Texas, Florida, and the west coast. He retired in 1984 from the Bucksport mill where he was production manager. Ham Radio Inspired. Bob became interested in ham radio after his friend Cliff Boviar W1RBD, who was paralyzed and worked at the paper mill in Jay with him, showed Bob his station. He took the test in Wilton and remembers Phil Young-W1JTH and some of the other senior hams being there at the time. He was first licensed as WN1GRG as a Novice. “We had to stay on cw for a year before we could get the ’n’ removed,” he said. His first station consisted of a Globe Scout he built himself, and a Hallicrafter receiver, and an off-center fed dipole. “Sideband came in during the early 60s and they took 11 meters away from us,” said Bob. Bob has always liked 80 meters and can usually be found nowadays on 3940 kilocycles. However, he used to get on 15 and 20 meters, especially when he was in Florida, so that he could keep in touch with his ham friends back in Maine. Bomber and Fighter Jet Down! Bob enjoyed the public service aspect of the amateur radio service and actively participated in emergency communications. On two occasions he provided communications assistance when military aircraft crashed in Maine. In 1963 a B-52 bomber crashed on Elephant Mountain. Bob kept about a hundred kilocycles clear on 80 meters in case they were needed in support of the search and rescue operation. Bob had maintained a relationship with the commanders of the Bangor and Limestone bases. When a fighter jet was lost out of Bangor in 1961, he relayed information to the base that he received via cw from a mobile ham on location at the crash site. He had certificates from the military for his efforts, but lost all of his ham radio records, logs, and personal belongings in a house fire when he lived in Orland. He also lost about $5,000 in ham radio equipment in the fire. That event kept him off the air for a few years. Section Emergency Coordinator was a title Bob held for quite awhile in Maine and he had net controllers in each county and even started a net on Sundays. He used to travel to clubs to talk about emergency communications, including clubs in Ellsworth and the St Croix club in Washington County. He would also visit the FCC Monitoring Office in Searsport. “At that time they had a lot of problems with CBers using too much power,” said Bob. He recalls the FCC monitoring wayward CBers in Washington County. The Brady Bunch family pales when compared to Bob’s & Rena’s family. They were both widowed when they met, and decided to get married. Between the two of them they have 14 children, about 29 grandchildren [ed. note: it’s easy to lose track when you have that many! ], and about 22 great-grandchildren, and counting.“They all blend together like one big family,” he said. None of them are ham radio operators. Yet. W1GRG was born and raised in Maine. He is now 91 and still enjoys playing golf, attending the Ellsworth ham radio breakfast meetings, and getting on-the-air. Ed. Note: You can usually find Bob on the Maine Seagull Net on 3940 kilocyccles Monday through Saturday at 5pm Maine time. Or, you might catch him at the Ellsworth ham radio monthly breakfast socials usually held on the first Saturday at 0900 at Denny's. Copyright (c) 2017 Signals Downeast, N1EP.